With both Widnes and Nottingham in contention for play off spots, the double header weekend between the Wild and the Lions took on greater significance. For the Saturday night home game, Greg Ruxton took his place in goal and with Pavel Vales unavailable, young Sheffield based trainee Tom Barry was selected along with George Crawshaw. Josh Benstead backed up in goal. Bobby Caunce was on honeymoon and Chris Preston and Daniel Bullock were unavailable. The game got off to a lively start with Wild pressing for an early goal.After just 50 seconds an incident near the Widnes goal saw both sides taking roughing penalties.Fierce shots from Supa and Greaves were both well saved by Gilfoyle. An incident in front of the benches saw Tom Ratcliffe and connor Glossop fighting. Both took 2+2 for roughing.At 10.42 Widnes took the lead when Filip Supa fired high into the top left corner. In a closely fought game both netminders were in regular action. At 19.25 a slow line change saw Lions Adam Andrews with an unopposed shot from centre ice which beat Greg Ruxton for the equaliser. Minutes later, the scorer was carried from the ice with what looked like a serious leg injury. After Filip Supa saw shots saved, Wild, after taking minor penalties, came under pressure. Shots were flying in and twice Nottingham shot wide from close in. Within minutes they had rattled the crossbar. At 33.40, with Wild attacking, a sharp turn by Sam Dunford in the corner, saw him caught accidentally by a high stick. Blood poured from a mouth injury, leading to a long delay while the ice was cleaned. The player responsible was ejected from the game. Despite having a lengthy powerplay, Wild were struggling to control possession and shots on goal were few. 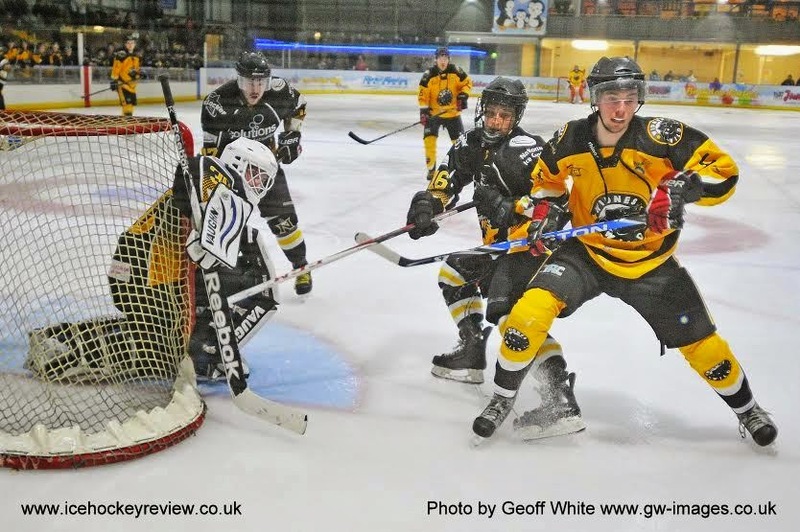 As the Lions broke away into the Widnes end, a loose puck was cleverly passed up the ice by netminder Ruxton, allowing Shaun Dipnall to fire a cross ice pass to Filip Supa who beat Gilfoyle to put the home side 3-1 ahead at 38.16. Nottingham changed their netminder for the final period and within minutes Tom Hovell had been called into action, saving from Pollitt and Supa - one low glove save to the left preventing a certain goal. Hovell then twice made remarkable stretch saves with his legs as Wild looked to clinch victory. The goal of the game finally came for Widnes at 52.53. A flowing move down the right saw Shaun Dipnall finding Ben Brown with a peach of a pass. The speedy forward skating away from the goal, managed to lift the puck into the roof of the net using great skill and composure.A delighted home crowd rose after witnessing a goal to grace any game. With just three minutes remaining, an occasional Nottingham attack, saw the puck come loose close in for Kieron Raynor to take a short pass from Ben Wood to force the puck into the net at 57.01. Worse was to come and hesitancy in defence allowed the dangerous Stuart Parker to fire home at 58.13. Widnes called a time out and managed to see the game out to take two vital league points. Ben Brown took the well deserved MVP for Wild. The general concensus was that this was the game of the season to date. Hopefully a big crowd will fill the rink on Sunday night when the in form Hull Jets are the visitors.